There are 20 Pueblo villages left in the Southwest; there were at one time in history 200. Each of the 20 Pueblos is famous for art and/or crafts and each has a specialty. Maria Martinez lived in the Pueblo of San Ildefonso and she was famous for creating black pottery. Read and skim the magazine about Maria. Mention that, like all Native Americans, Maria respected the earth and its resources. She only took enough DIRT for one pot at a time so that she did not waste it. Remind them to look around at lunch and be aware of what we waste! 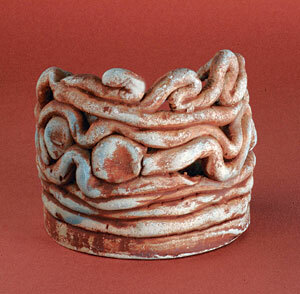 Divide a clay chunk into 3 equal pieces and roll each new chunk into a coil. It takes a little practice, using a forward rolling motion with the hand held straight and using palms and gentle pressure. It works best to stand and use a forward rolling, then lifting, hand motion. When the clay moves toward the edge of the table, lift and move it back, starting over. It does not work well to roll the hands back and forth over the coil. Roll each chunk into a coil, then roll coil up and place in bag. Wet paper towel and drop into bag with coils, write name and section on the tag. Gather ends of bag and put on twist tie. Make sure the whole bag is closed tight. Pass everyone a paper towel and round slab circle. (Teacher should put last name and class section on bottom of each.) Teacher does a demonstration of scoring and painting slip around top edge of slab. Add coil, pressing gently, pinch off and smooth together ends when it is wrapped around slab and they meet. Build three rows high, and then add some decorative finishes for the last two rows, such as S shapes made from coils, waves made over a finger, or rolling little balls, pinching them flat, and adding them in openings made by the wave designs. Be sure to stress that everything that is added MUST be scored and slipped. Also stress that the clay coil pot should not be picked up. Turn the paper towel as you work to build it, and the shape will not get lopsided. Add two more coils in the same way. There are now three rows high on the slab. The last two rows may be any design we have talked about. Smooth out any cracks by painting water or slip over them. Projects must dry and be fired. Paint acrylic gloss medium tinted with blue tempera on whole top and sides of coil pot. Do not paint the bottom. Make sure you get into all the crevices with the bristle brushes and acrylic medium. Clean and dry the brushes thoroughly. Gently fan pot till completely dry. Paint the sienna over the whole pot covering the acrylic with sienna. Do not paint the bottom. Teacher wash off the sienna, leaving the brown color in the deeper parts to create an antiqued effect. white clay  individual chunks about 3" × 3" × 6"